Back in Germany and for more than two decades, Felix has been creating musical compositions using special instruments like the viola, flute, xylophone and music box that produce unique sound effects and frequencies into his music that capture an infant’s attention and stimulates their imagination. Together, these melodies, tones and harmonies create musical games for babies that engage their listening ability and enhance their overall sense of well-being. This music is worldwide distributed. 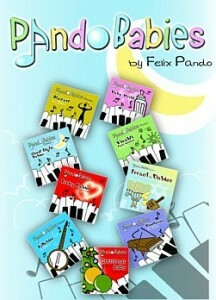 Felix’s newest Pando Babies Collection, “Sounds of Living”, is truly a one-of-a-kind series of 3 CDs that introduce infants to sounds they would often encounter in their everyday surroundings: 1) … in the City, 2) … on the Farm, 3) … in Nature, 4) …Waltzing for Babies. The melodies are enchanting, and both infants and parents alike will enjoy the musical environment they create within their home. Within the same concept for babies, Felix and Pando Films have created videos specially made for children who are transported to numerous beautiful and exotic locations around the world. These videos are: Vivaldi in Nature for Babies and Waltzing Under the Sea for Babies.